New 2018!!! This home is a lake lovers dream! 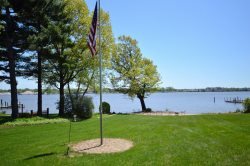 Lazy Days Retreat sits right on Lake Macatawa. There is a shared dock available for you to walk out on but not available to dock a boat. The backyard is 1 acre of beautiful landscaping and mature oak trees. There is a private sandy beach area that is perfect for the little ones to swim and play and a fire pit and patio along the shoreline. There is a playset in the backyard for the kids and 3 kayaks available for you to use during your vacation. Imagine sitting on the large deck watching the sunset over the lake while your family makes vacation memories that will last a lifetime! This newly updated home features 4 bedrooms and 2 full bathrooms. There is a formal dining room with access to the deck and stunning views of the lake. Your family will have access to everything while vacationing in this home. You are walking distance to Howard Dutton Park, "Captain Sundaes"ice cream, mini golf, restaurants, DeBoer Bakery (cinnamon rolls are a must!) and there is a public boat launch just down the road!